SEAT has relaunched Cupra as a standalone brand at the Geneva Motor Show 2018, with a high-octane version of the Ateca SUV. The 300PS Cupra Ateca will be the first of a new range of Cupra-branded cars, with performance-focused versions of the Leon and Ibiza expected to go on sale before the end of 2018. SEAT hasn't released any details on pricing, but the standalone Cupra cars will get a new badge and be sold via specialists dealers that will be embedded within existing SEAT showrooms. 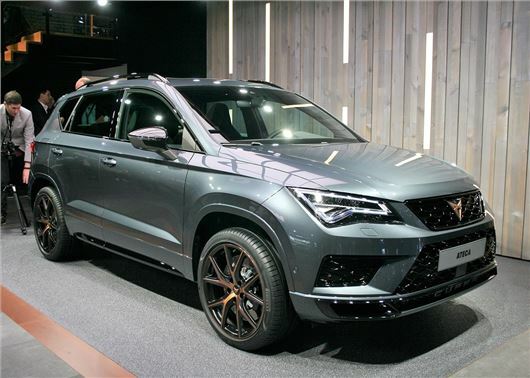 The Ateca is the first to get the Cupra treatment, with racing spoilers, diffusers and quad exhaust pipes. The high-performance SUV will use the same 300PS 2.0-litre TSI engine as the Golf R and also use a track-focused seven-speed DSG automatic gearbox and all-wheel drive system. The interior matches the eye-catching exterior, with generous helpings of leather, aluminium and Cupra logos. A moulded carbon fibre dashboard and bucket seats will make it to the options list, along with carbon spoilers and carbon door mirror caps. The Ateca will be joined by Cupra versions of the Leon ST and Ibiza, although little is known about the former. Expect the Leon estate to use the same 300PS 2.0 TSI petrol engine and all-wheel drive system as the Golf R.